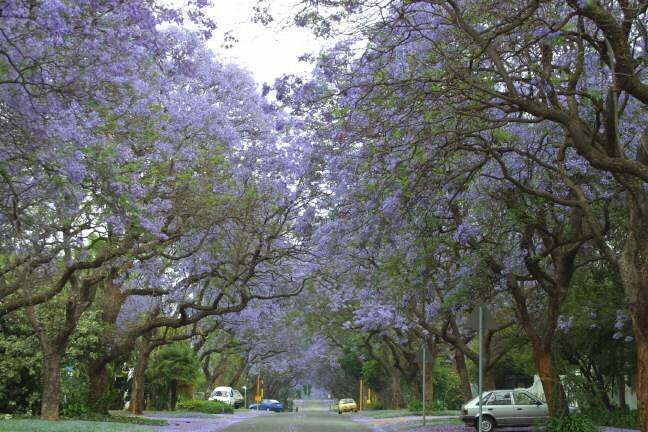 Here are a few pictures of various places in South Africa. 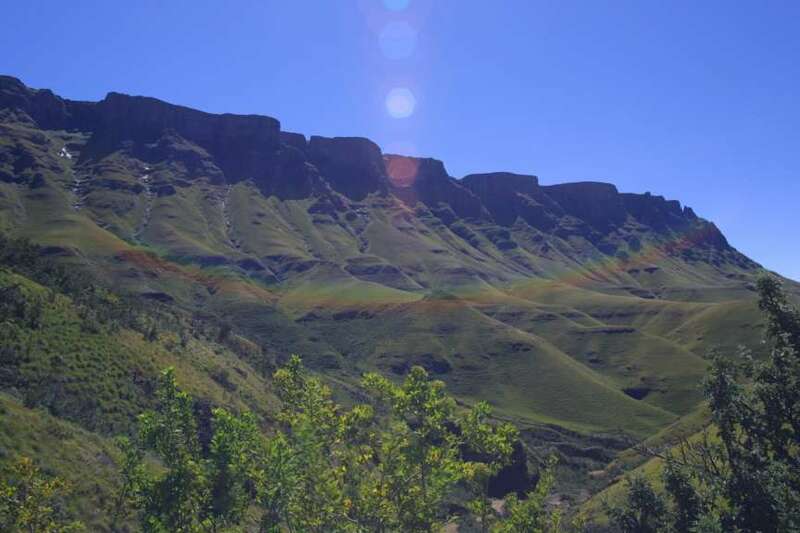 Sani Pass is an absolutely stunning entrance to Lesotho – a mountain kingdom roughly the size of Belgium. 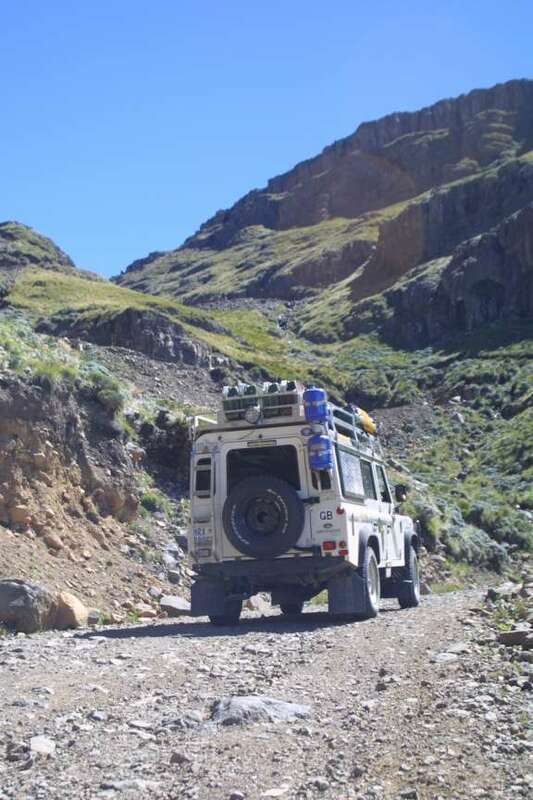 We noted a sign permitting only 4x4 vehicles to drive up the pass,understandable for we needed the diff-lock and, at times, low ratio gears. 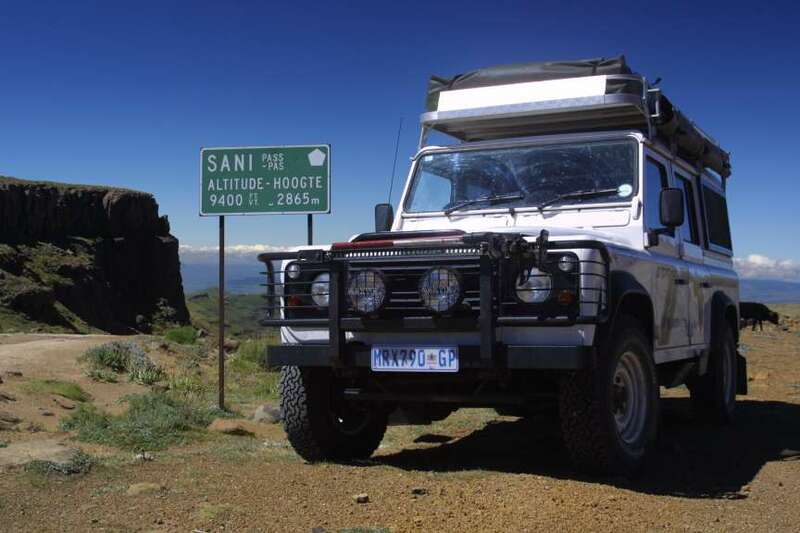 At 2865m, Sani Top is the border post for entry to Lesotho. After a lunchtime snack in the highest pub in Africa we continued along the A3 (which incidentally bears little resemblance to the dual carriageway passing Guildford in Surrey,UK) towards Thaba Tseka. Daph struggled gamely up the hills and around the many potholes on the dirt road and endless winding mountain ridges. Daphne attracted a great deal of attention. The children from the poorest villages ran, sometimes considerable distances, to meet us on the road, holding out their hands for sweets. 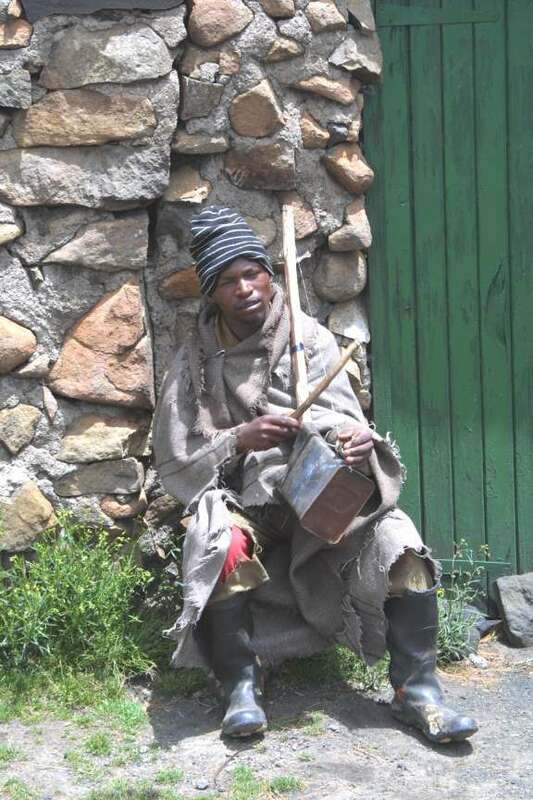 Many of the older children, some on horseback, were looking after cattle or goats. People wore coloured wellington boots, a blanket wrapped around them and a woolly hat. Our progress was slow, and eventually we agreed that we would rough camp beside the roadside. It took us some time to find somewhere sufficiently off the road and out of sight of a settlement, and we camped on the ground to avoid raising our profile to encourage unwanted intrusion. After extracting Daph from our position the following morning and the usual round of checks, we noticed that oil was dripping from the oil filter. This was frustrating since she had been serviced and checked immediately before leaving Pretoria. We thought we must have hit something getting either in or out of our camping hollow, but there was no trace of oil on either our route in/out or the overnight spot. Replacing the lost oil, we decided to monitor the situation over the next 20 km to Thaba Tseka. By the time we reached Thaba, the situation was serious. Arriving at the BP fuel point with the engine oil light on, we could not find a mechanic (it was Good Friday). We had used all the spare oil, so Catherine went with the lady garage owner and her son in search of oil and if possible a mechanic. The lady spoke quite good English, and was happy to help, telling Catherine that it was very difficult to cope in a foreign country when you did not speak the language or know anyone. Everyone they met seemed to know her, so some time was taken for social interaction at each of the shops visited. Remembering one of the principles of life in Africa, that nothing can be hurried, Catherine kept smiling at everyone she met and waited as patiently as she could. Some 45 minutes later, Catherine returned with oil and a couple of mechanics. The mechanics put their heads under the bonnet and tightened various nuts and bolts, for it appeared that the severe vibration caused by the roads had loosened a joint. After wielding a 22 inch spanner, and adding some oil to test the repair, the problem was pronounced fixed! For our second night, we camped at Marakabei Lodge, nestled at the bottom of a valley. The owners were very welcoming. There were a few others staying, and later we were introduced to Lesotho’s South African High Commissioner, who happened to be staying at the lodge whilst back for Easter. The next day, we drove to the Mohale Dam project, a similar concept to the Katse Dam. 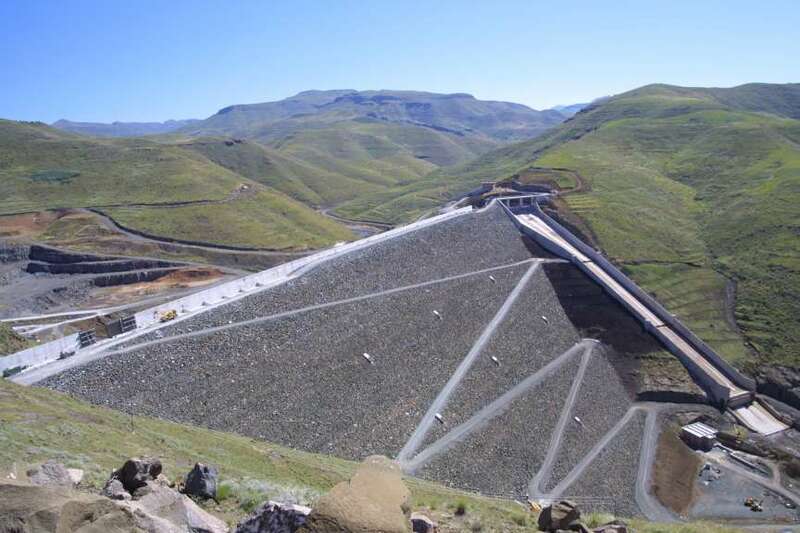 Lesotho’s water will be dammed within the natural valley and power generation and water will feed into the Vaal Dam system for the Johannesburg region. The most noticable consequence for us was the considerable improvement in the road - good tar has replaced broken tar and potholes or rough graded track. 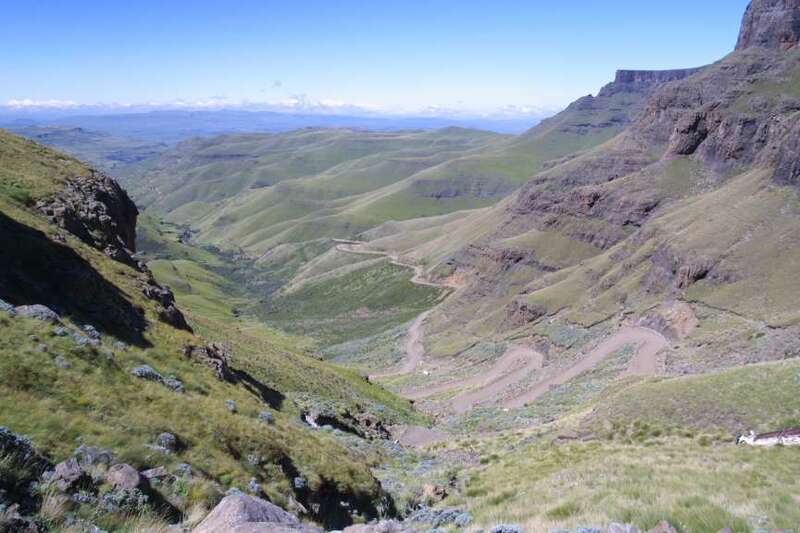 We pushed on down Bushmen’s Pass into the Lowlands (interestingly Lesotho has ‘the highest lowest point’ than any other country in the world!) 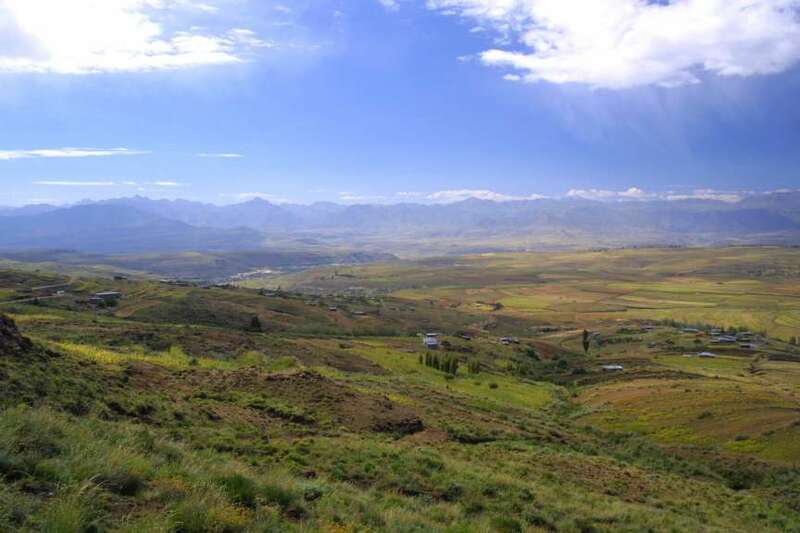 and headed south for Malealea Lodge, the best location for pony trekking in Lesotho. We passed through the ‘Gates of Paradise’ [photo] - the pass presenting a wonderful vista of the Malealea valley. Mick and Di Jones are the wonderfully accommodating hosts at the lodge. Activities offered include hiking, trekking (horse or foot), 4x4 trails, or just relaxing. 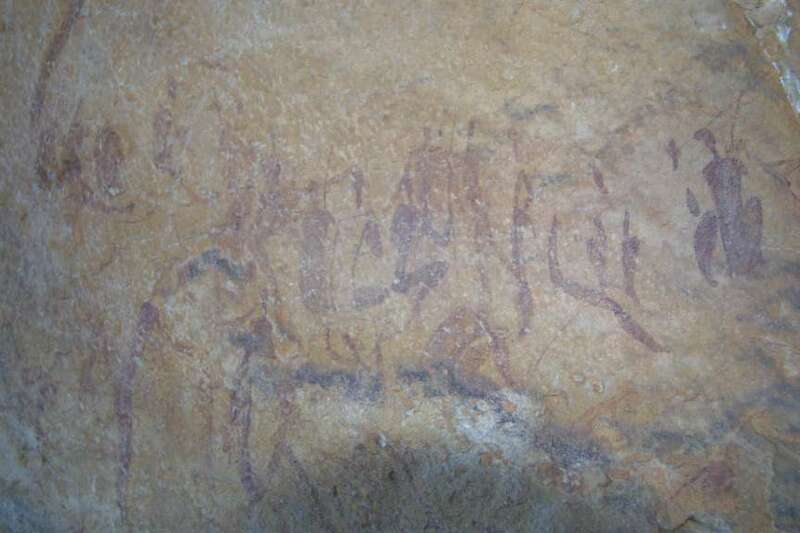 We stayed for 2 days, exploring the Bushman’s paintings within the riverine valley below the lodge. Our final day within Lesotho was the short trip to Van Rooyen’s Gate, to complete around 900km through Lesotho. We used the ContiMap of Lesotho, sufficiently detailed for travelling by road, although the time and distance estimations varied considerably. We did not need to use GPS for this part of the journey, as the signposting etc was accurate. 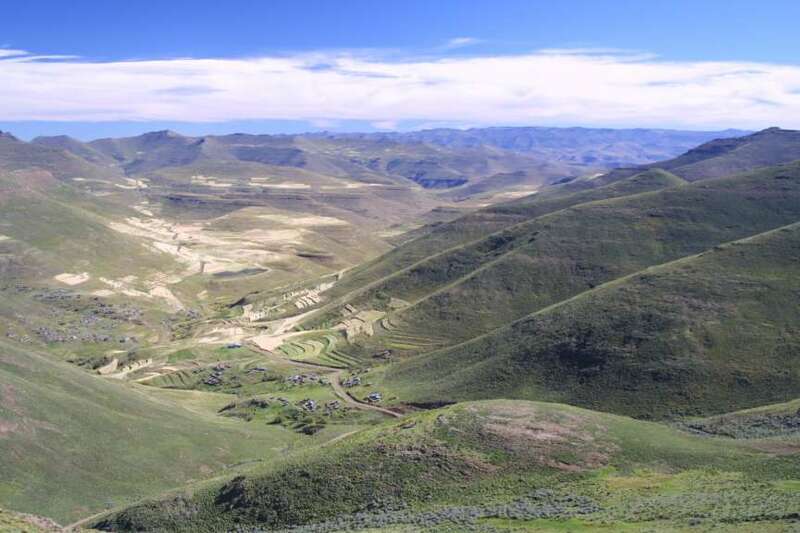 It took us 2 days to cover the mountainous section of west Lesotho, compared to a few hours over the eastern section of the country. Grahamstown is the capital of “Settler” country. There is still a strong English feel in the town, though today it is predominantly known for Rhodes University, 4000 students strong, within a town campus not dissimilar to St Andrews in Scotland. The town itself was rather quaint – full of beautiful old buildings, a great deal of intricate painted wrought iron work, and refreshingly few high walls. However, there were two large settlements on the outskirts of the town as an ever-present reminder of harsh times. Similar to Edinburgh in the UK, Grahamstown hosts the National Arts Festival in July and the associated Fringe Festival. We camped at the rather austere Municipal site, went to the Frog and Parrot for dinner, and just as we were coming back to Daphne, Catherine spotted an officer getting out of a car marked “Visible Policing” to put a piece of paper under one of Daphne’s wipers. On questioning, he said we were parked facing oncoming traffic on the wrong side of the road, apparently a crime in SA. We were a little disappointed (though not surprised) since the parking attendant had waved us in and told us she would look after the vehicle. We went to the Treasury building to pay the fine the next morning. We went in search of an internet café in the town the following day. The first (official) place we found would not let us plug-in our laptop. However the second, although not billed as an internet café, was more accommodating. Without a second thought the staff on the second floor in the computer repair section allowed us access to a local phone line for us to update our website Groot & Sherry is located within a very old building, 2 floors above a stationery shop. On the ground floor of the shop, there were floor to ceiling cabinets down the sides with plaques saying “Wedding Gifts”, “Recent Fiction” etc, obviously painted before the days of self service. Needless to say, the words on the plaques bore absolutely no relation to what was in fact on the shelves. We learned that the building houses the oldest family run newspaper still in circulation within South Africa - the newspaper production area at the rear of the building was almost a museum to the past former glory. 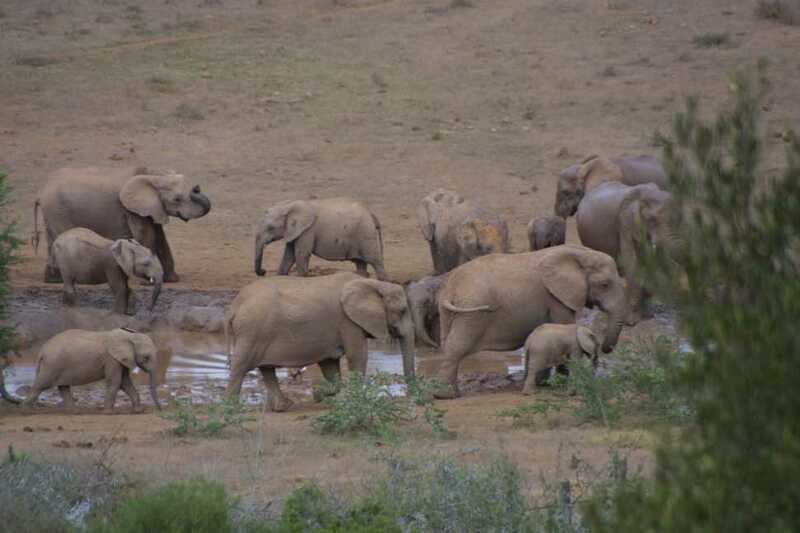 The fees for Addo Elephant Park were quite expensive – R85 to camp, R40 entrance for each person. We found a spot overlooking the hill near the main waterhole to camp. Approximately 50 elephants were just starting to take to the hills. There were lots of baby elephants, who seemed only just able to keep up with their mothers, due to the steep gradient. We noted that many of the elephants were in fact tuskless. The animals spent some time on the hill in front of our pitch grazing. When they had left the area, we turned our attention to other wildlife, and saw several black backed jackals bushbuck, hartebeest and warthogs (in fact a warthog had taken up residence in the campsite, enjoying the short grass). The campsite was well appointed, with hot water, baths and showers and a room with hotplates for cooking plus a sink for washing up. We woke to see no elephants on the hill, but after breakfast, we spotted a group hurtling down the hillside. 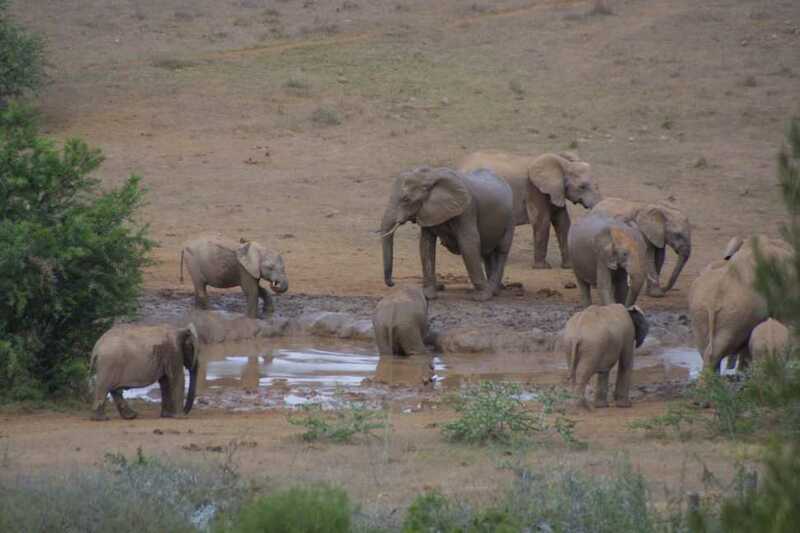 We went to the waterhole and took some photos. It was after this that Daphne’s driver’s door (always difficult), completely gave up and we were unable to open it at all, so we had to clamber over from the other side or climb in through the window. Borrowing a copy of “Yellow Pages” from the camp reception, we found an address in Port Elizabeth where we thought we could get it repaired. The garage, a Peugeot franchise, spent much of their time and expertise fixing Land Rovers, as they had previously had the Land Rover franchise, and retained their qualified mechanics, offering excellent service. We drove on, through a blinding thunderstorm with very strong rain to Knysna. Due to the weather we decided to stay in a lodge, as it was also late. The next morning we left early, for we had a 500km to drive to Cape Town. The road was quite dull, except where vehicles behind us kept expecting us to drive over the yellow line (on the side of the road-the practice is illegal, though many people do this) so they could overtake. We refused, for we felt it was dangerous as there were often vehicles stopped by the side of the road and it was not very easy to stop suddenly with a heavily laden vehicle. Also people walked in the yellow line area as if it were a pavement. Anyway, some drivers were very rude and made signs at us on passing. We felt that since we were not that slow, it should not have been an issue. Interestingly, some of the larger lorries now have stickers on the back saying that the vehicle will not cross the yellow line! 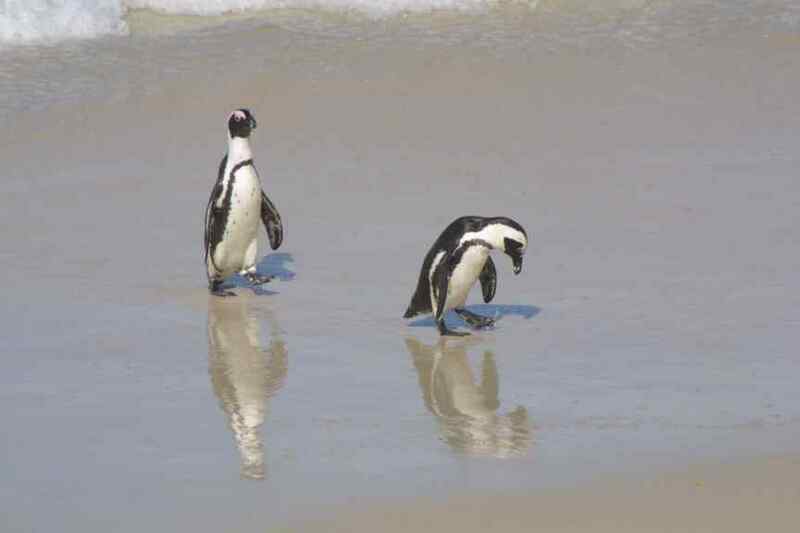 Events have conspired to alter the ‘Cape Town and environs’ portion of the website, since our stay has been lengthened. Where better to convalesce than within one of the most cosmopolitan and vibrant cities in the world? However, no matter how much we have enjoyed our stay our thoughts will always be further on down the road as we originally planned. 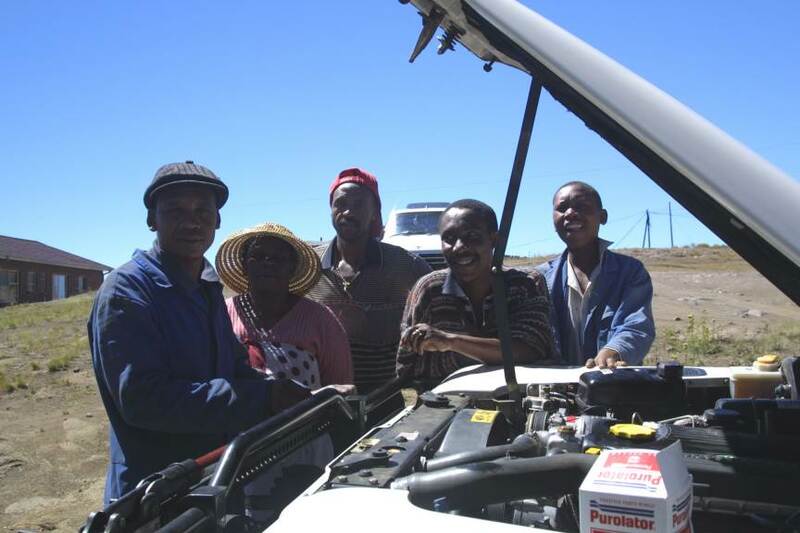 The primary thing that struck us was how friendly the people of Cape Town were towards us. 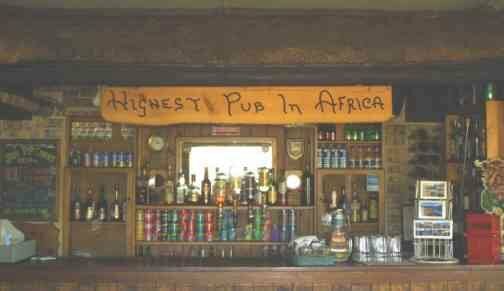 We found all those with whom we dealt with supremely friendly and very helpful, almost to the point of embarrassment. 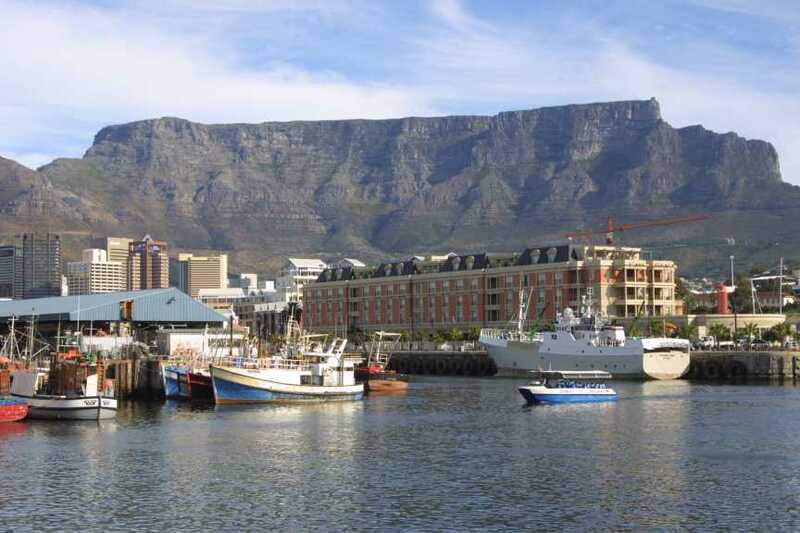 And what better backdrop to any city than Table Mountain (1086m) - it totally dominates the city from all angles. 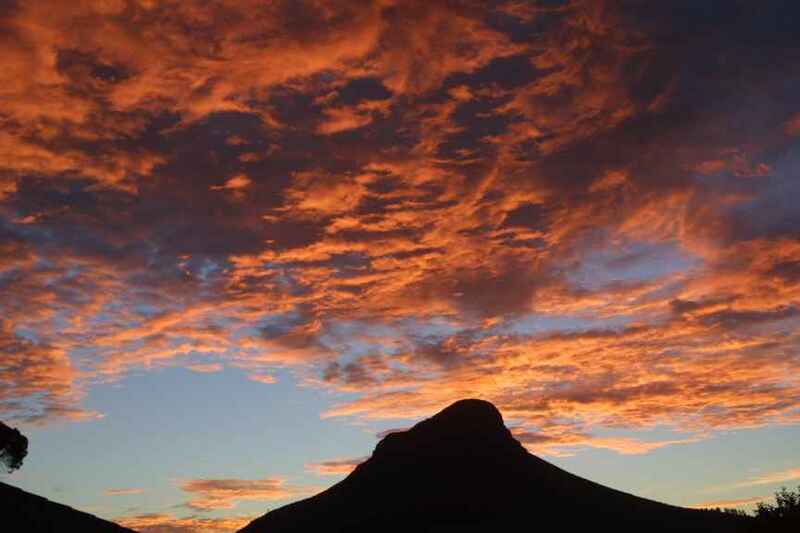 Staying within the city bowl, we were able to look up at the mountain, out over the harbour or wait for the spectacular sunsets over Lions Head. 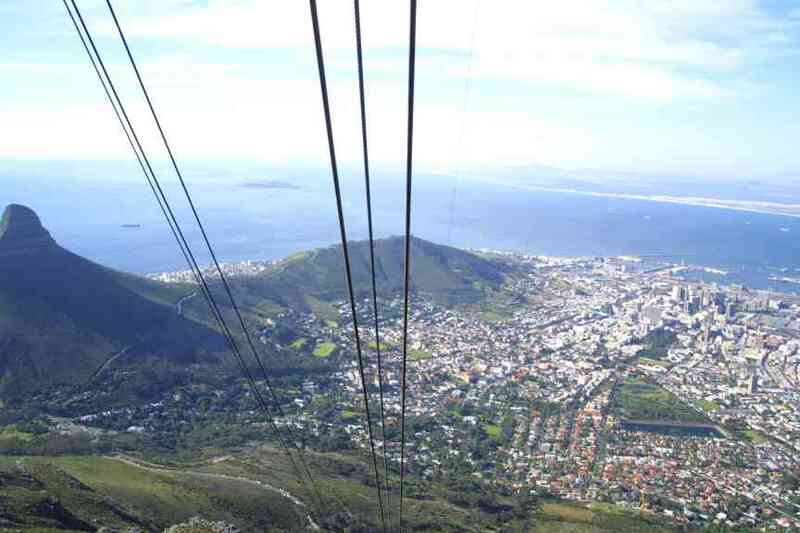 When the weather is fine, a swift walk up Platteklip Gorge together with a descent via the rotating cable car provides a wonderful perspective on Cape Town and the surrounding area. 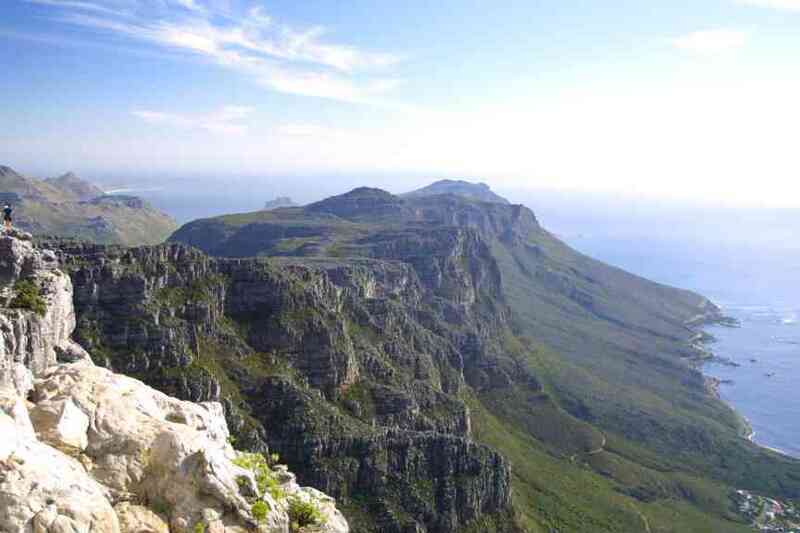 There are many different trails up Table Mountain, here you see just one of those. They vary in difficulty so there is a way for anyone who would like to walk, scramble or climb to the top. It is important to have take warm clothing, whether you choose to walk or take the cable car. The weather is extremely changeable - one minute the sky is completely blue and another the clouds come down and it can become quite cold. 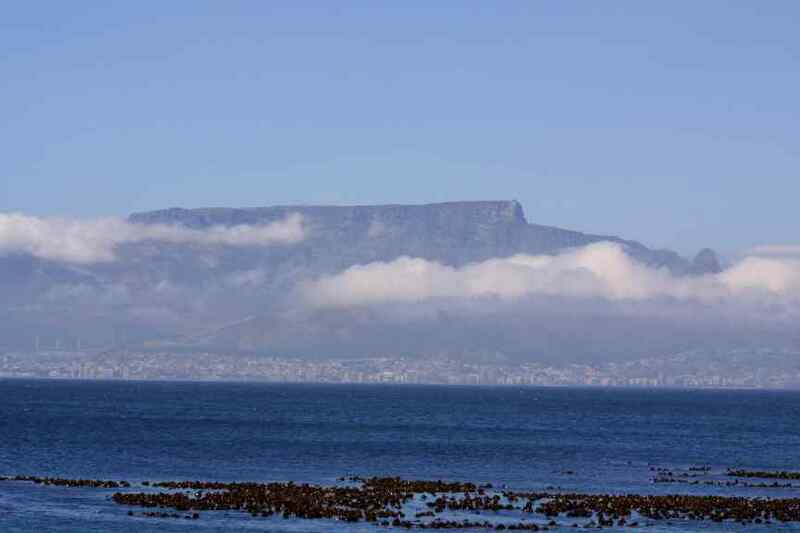 When the clouds are floating over the edge of Table Mountain they are the described as the "tablecloth". 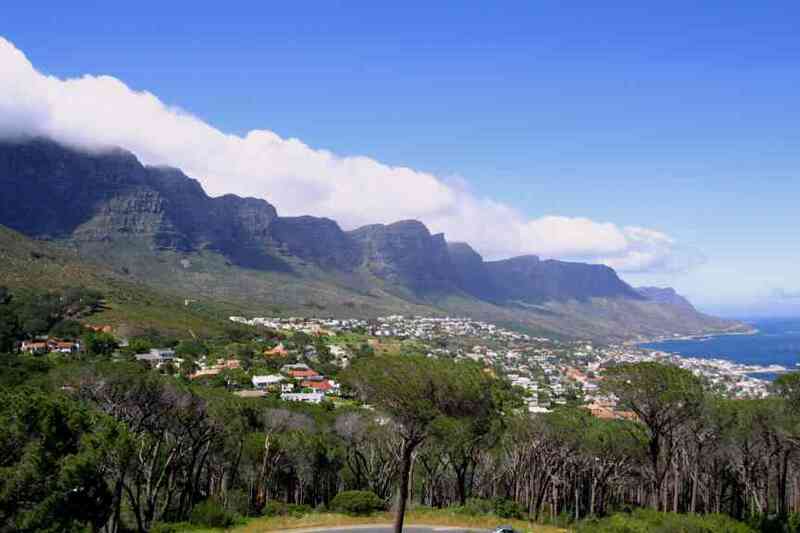 The scenic drive down to Cape Point, through Kirstenbosch Gardens, through the delights of Constantia, Muizenburg, Simons Town and back via Hout Bay and Camps Bay demonstrates the diversity of the area. 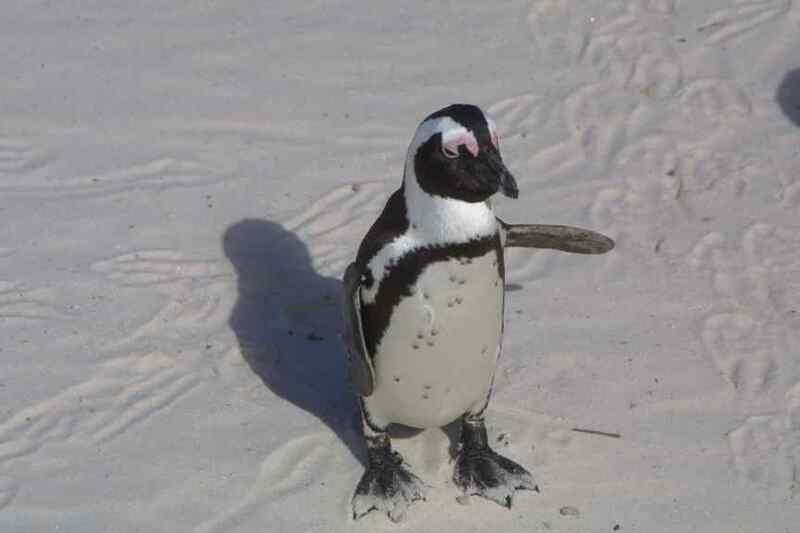 We particularly enjoyed the Jackass Penguins at Boulders Beach. 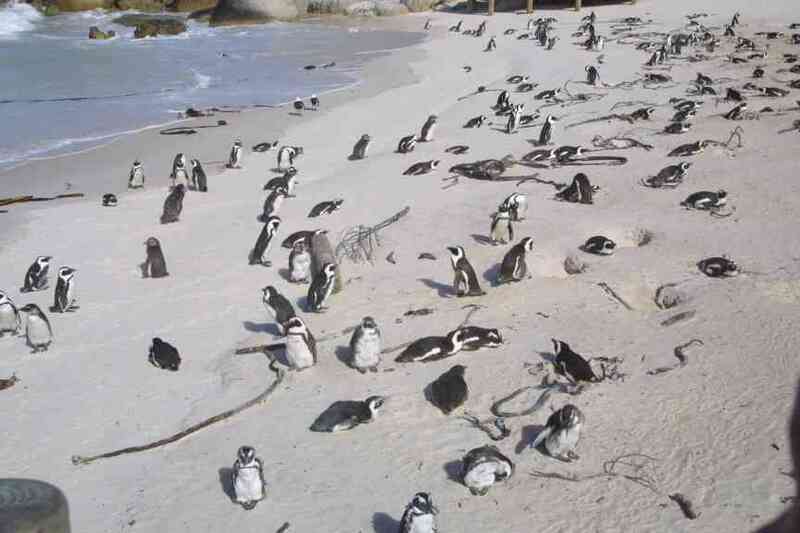 On the day we visited Boulders Beach it was extremely windy, and though most of the penguins appeared to be on the beach taking in the bright sunlight, others had walked inland, up via the rocks to the dense scrub type vegetation, where they had made sizeable burrows in the earth. Some were sitting on one or two eggs. We also saw many abandoned eggs - apparently it is quite common for eggs to be left. At the other end of the spectrum is Cape Flats on Mitchels Plain, where around 4m black and coloured people live, seeking an existence within a capitalist society. 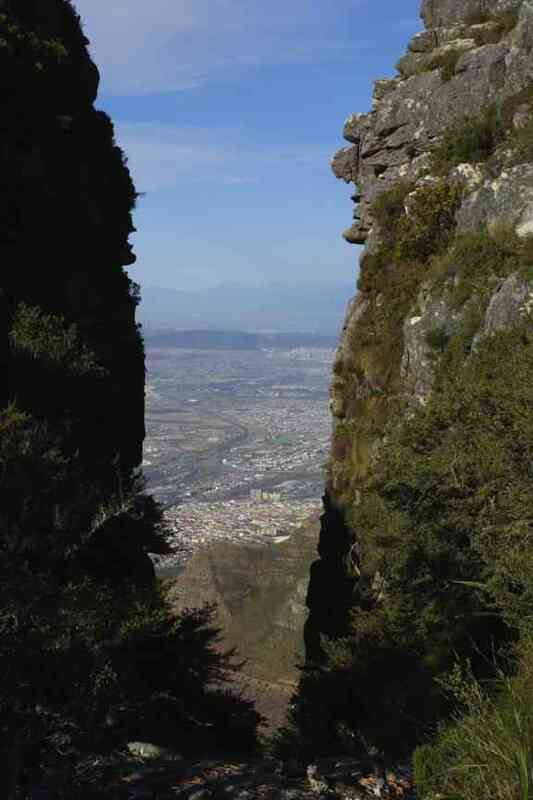 Cape Town clearly demonstrates the divide between those that have and those that have not. During our stay, it became clear that crime levels were not as perceived within western cities. True, Paghad target the drug gangs and there is inter-ethnic violence within Cape Flats, but the level of black on white crime is not overtly malicious – more akin to opportunist theft. 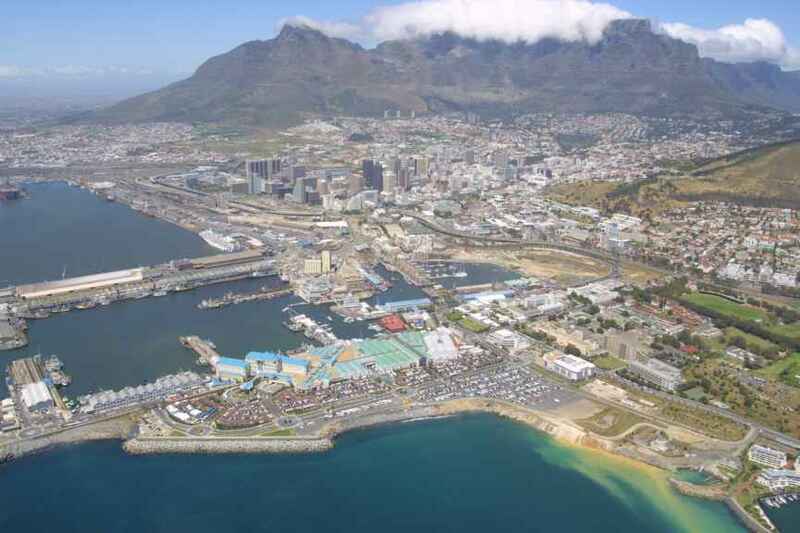 Certain areas are known for their problems; for instance Cape Town has a drug problem, and some of the drug related crime is attributable to immigrant Nigerians at Sea Point. However, great efforts are being made to improve the security situation in order to attract visitors. Improvements to various areas of town are evident, and these are paying dividends. Security measures taken by individuals to secure their houses are evident, although not quite on the scale as Johannesburg or Pretoria, where electric fences and barbed wire are much more common. 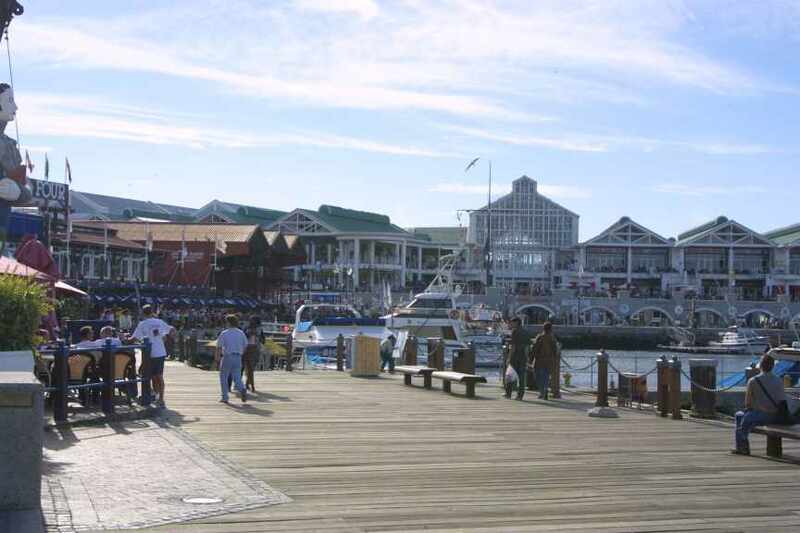 Both the town centre and the V&A Waterfront are a natural focus for regeneration. The old town has been cleaned up and the oldest building (Castle of Cape Hope) is now a fine historical museum. Interestingly on our visit, there was an anniversary parade by the Cape Town Highlanders commemorating the Battle of El Alamain. The famous Long and Kloof streets have been cleaned up in recent years, yet the original architecture and atmosphere has been retained where possible. 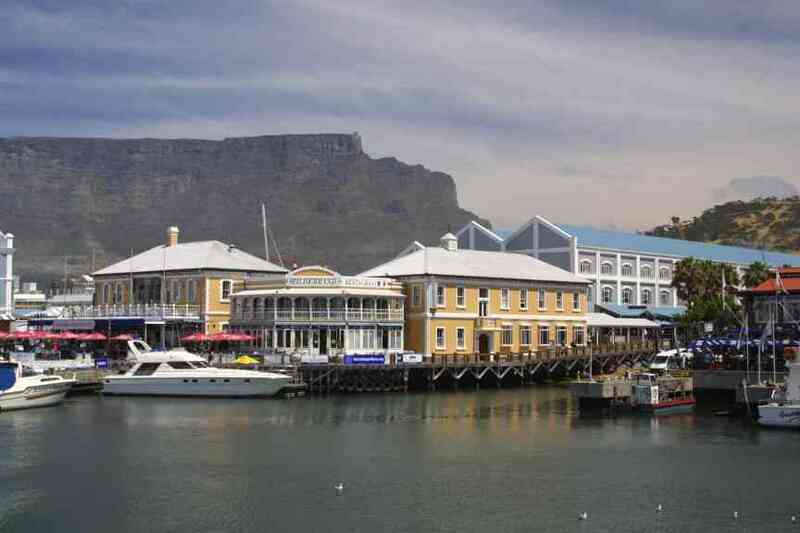 Now home to the many backpacker hostels and bars, this area is still one of many lively evening venues within Cape Town. 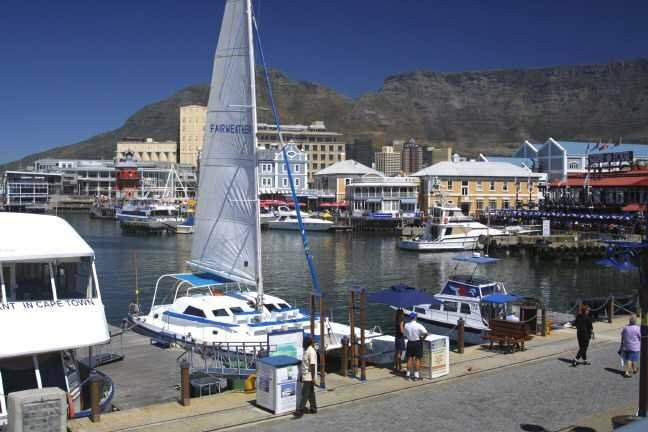 The Waterfront is a natural attraction, and one of the secrets of its continuing success is the use and enjoyment by the locals in addition to tourists. 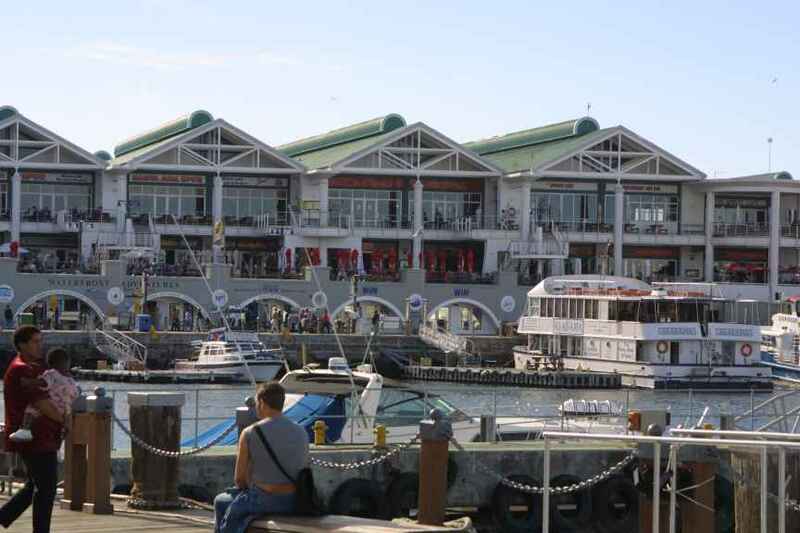 It is from a new building within the Clocktower Centre at the Waterfront that the ferry takes tourists out to Robben Island for a sobering assessment of what activists and political prisoners endured for their beliefs. Dining out presents a challenge to the waistline. Quality, diversity and price are all excellent. 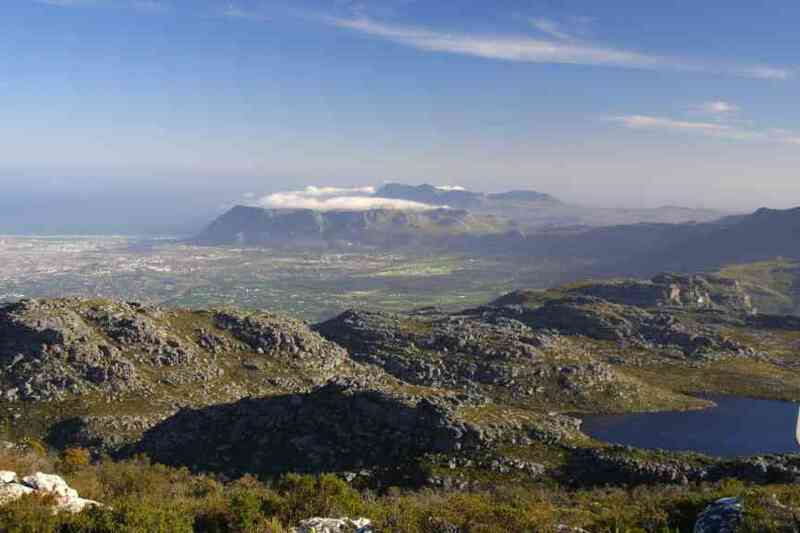 The historical view point that the Cape was the bread and food basket for the British Colonies is maintained within the Winelands. Stellenbosch, Paarl and Franschoek possess fine wineries that accept visitors and provide tastings, coupled with stunning backdrops and scenery. This area is a must for a few indulgent days on any travel itinerary. 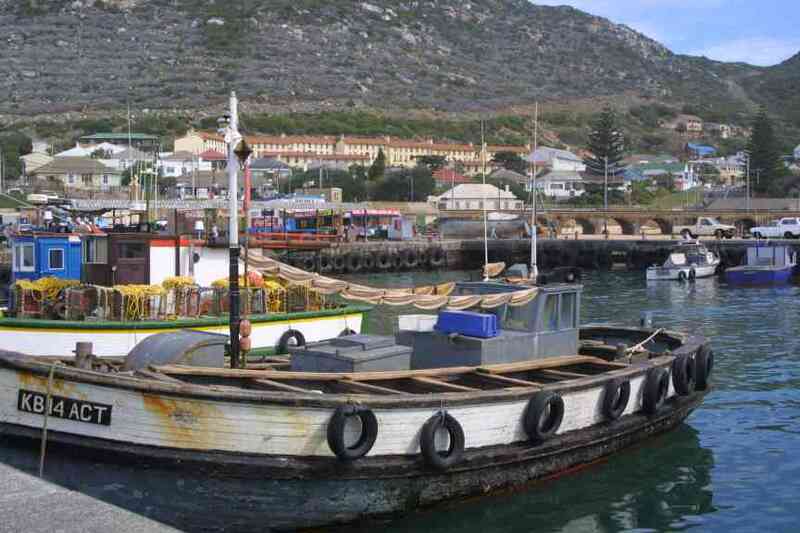 The Garden Route is well known to attract numerous tourists annually. In Hermanus we were lucky to see Southern-Right Whales frolicking in the bay. Perhaps the whales were responding to the ‘whale-man’ ringing a hand bell, announcing the arrival of each whale in the bay! Sadly we did not have time to ride the Outeniqua Choo-Tjoe train (reported to offer breath-taking coastal views), although we did photograph the stunning waves on Wilderness beach. Inland within the Karoo, we transited the Outeniqua Pass to Oudtshoorn (famous for ostrich farming and the Cango Caves) and the Swartberg Pass, where we were grateful we were not travelling with an ox-cart wagon like the original settlers. 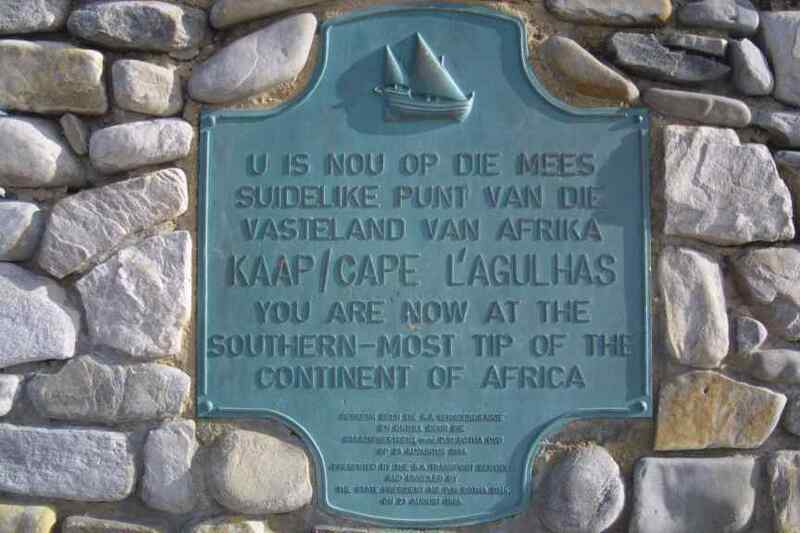 Cape Agulhas is the most southern point in the continent, at latitude 34 49 58.54”. We had to visit this place as it represented the symbolic start point of our journey. 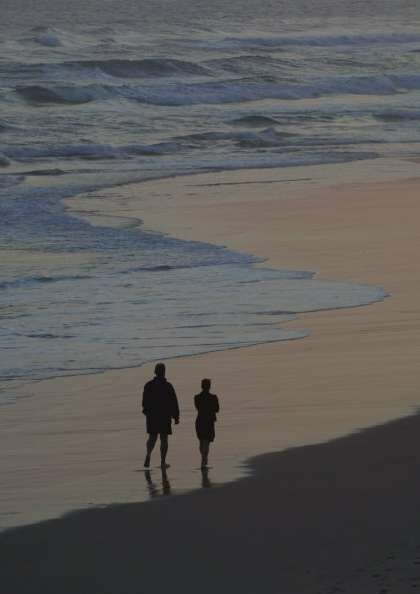 At this point two oceans meet - the Benguela current travels up the Atlantic coast (feeding the dry arid desert of the Namibian Skeleton Coast), and the Indian Ocean (warming the beaches of Kwazulu Natal) and divide. The long drive through wheat and sheep farming country to reach this point was unrewarding. 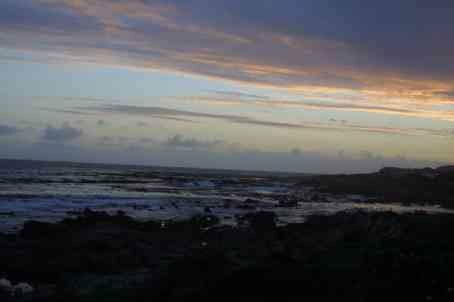 Apart from the dramatic waves, Cape Agulhas was not too impressive. 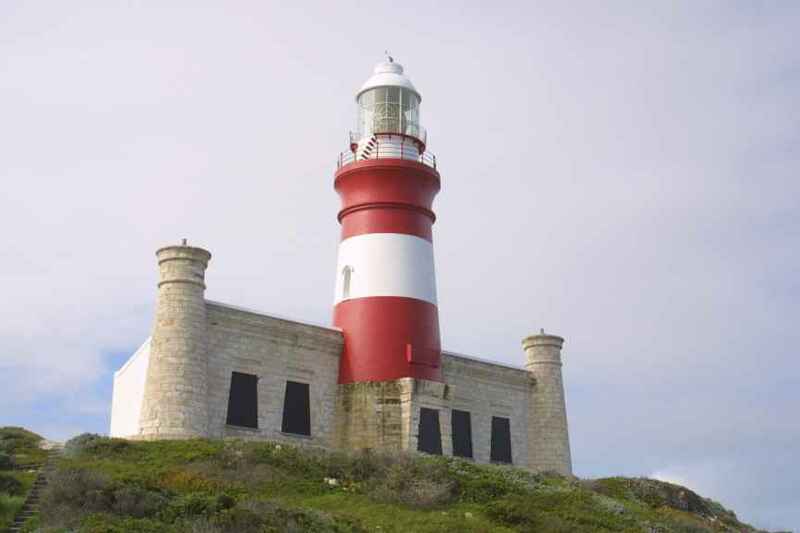 The lighthouse, built in 1848, provided a clear view across the peninsular and the small museum offered a detailed history of lighthouse development and shipping protection along the southern African coastline. The only tangible symbolic evidence to launch our trip was the small plaque marking the southern most point. 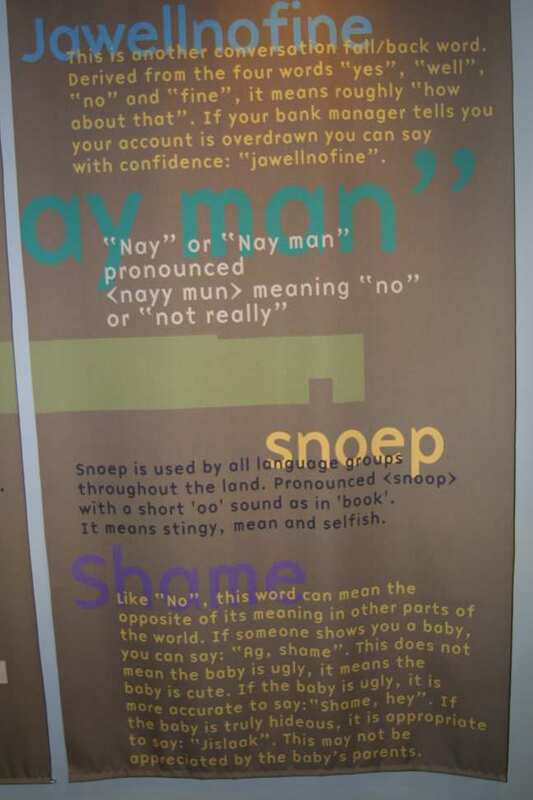 Although we have noted English language nuances throughout our stay within South Africa, these they have been most pronounced in Cape Town. Whilst Adrian was working in Pretoria, where most people spoke Afrikaans, we were generally addressed in that tongue and frequently had to explain that we only spoke English. 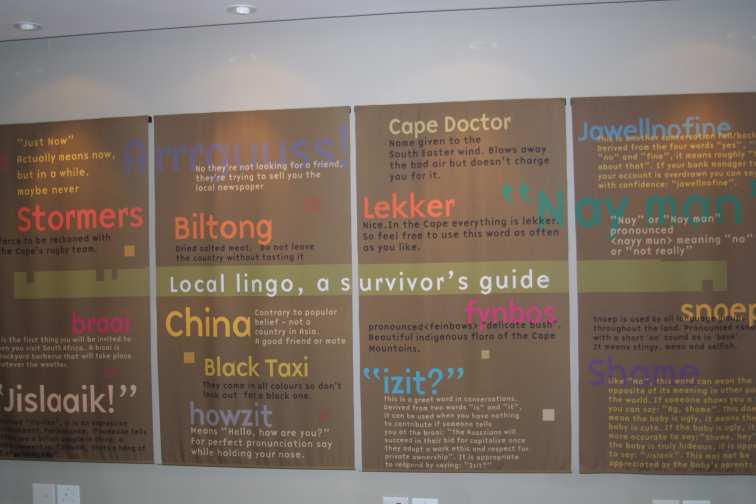 South Africa has 11 official languages (including English and Afrikaans). We found some of the most striking differences as somewhat humorous. For instance, the word "shame" has a double meaning, depending on the tenor of the voice and context used. Many times we have been describing the unfortunate events surrounding the accident, the conversational response is “shame hey” – meaning it is a pity. A similar response of “ag shame” to good events could throw the uninitiated, but this phrase is a positive affirmation of the event! A freeze in the Waterfront explains the differences well. The analogy given is that “ag shame” means a baby is cute, whereas “shame hey” means a baby is hideous! Time is an interesting concept. When an African says I will do this "just now", they mean that the task will be done in time (sometimes quite alot of time) but certainly not ‘now’. Also, when something needs to be done, South Africans talk about "making a plan". Here, they mean they will give the matter some thought, not necessarily that they are proposing a solution, even though in some cases they might come up with a viable proposal. There is an interesting freize on language at the Clock Tower on the Waterfront. Another notable difference in language is the use of the word "with". In UK English we would say "We will take the phone with us", whereas the South Africans would phrase this "We will take the phone with" in this case, the word "with" is used alone, and the "us" is implied from the context.